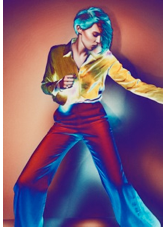 La Roux has unveiled a new video for “Kiss And Not Tell,” the second single from her sophomore release Trouble in Paradise. And, in keeping with her new, looser vibe, the video matches the song’s upbeat electro-disco style by taking a lighthearted, tongue-in-cheek approach. Which in this case means retro walkie talkies, lip phones and receivers spewing out rainbows galore as the singer channels old-school 1-900 chat lines. Watch it after the jump.